Softwood, tip cuttings can be taken from late spring early summer, from new unripened stems of shrubs. Semi-ripe or semi-hardwood cuttings can be taken towards the end of summer, when the new growth from last season has started to 'ripen', or become firm. Ripe, or hardwood, cuttings are taken from the middle of autumn onwards, once the growth has become woody and hard. Leaf cuttings, which can be taken any time during the growing season. Root cuttings, usually taken in winter when plants are dormant. The cutting method used will depend mainly on the source plant material. 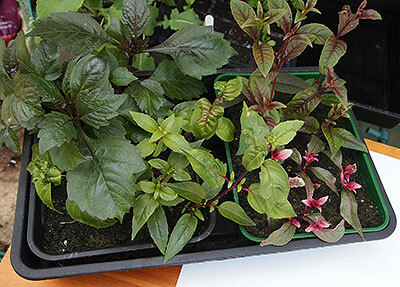 For example, fuchsias respond well to softwood cuttings, while Cape primrose (Streptocarpus) is best propagated from leaf cuttings, and Begonias can be propagated from either leaf or soft stem cuttings. The time of year also determines the type of cutting you are taking, fuchsias for example can be propagated from soft, semi-ripe and hardwood stem cuttings depending on the time of the year. Because cuttings are sections of root, stem or leaf, taken from the parent plant and encouraged to form roots and shoots of their own, the new plant formed will have the same characteristics its parent. This is a distinct advantage over propagation from seed, which can result in a wide and unpredictable range of variation. Also, cuttings they are virtually free and you save time because you are starting with already formed growth, which can flower much earlier than seedlings. Taking cuttings is one of the most popular methods of propagation used by commercial growers. You will find that large numbers of shrubs for sale in garden centres and nurseries are produced from cuttings. Normally cuttings are rooted in a free draining compost made with a high ratio of sharp grit, sand or even vermiculite. The main criteria are that it is free draining and well aerated. No nutrients are required, as the roots will form better as they search or them. Many cuttings will also happily form roots if simply suspended in a jar of water, such as, dianthus, tradescantia, fuchsia, busy Lizzie or African violet, to name but a few examples. Once rooted they can be potted up in a good quality compost. Suitable for a wide range of plants such as busy Lizzie, fuchsia, pelargonium (Geraniums), chrysanthemum and dahlias, also many house plants (such as tradescantia) and herbaceous perennials lend themselves quite easily to soft tip cuttings. Choose a healthy tip or side shoot and cut it cleanly with a sharp knife just below the leaf joint. Sever the lower leaves on the shoot and dip the cut end of the stem in hormone rooting powder. Make deep holes in a fresh pot (or seed tray) of free draining compost and insert the cuttings, firming the soil around them. Provide a constant temperature of around 18°C (65°F) or higher to encourage rapid rooting. Once rooted, gradually acclimatise the new plantlets to normal growing conditions and pot them on. It is important to acclimatise plants that have been grown in heated propagators, under cover and/or greenhouse conditions in order to slowly get them used to normal growing conditions. This is especially important when moving plants from one temperature to another or from high humidity to normal humidity conditions or they can quickly wilt. For example, cuttings grown in propagators need to be gradually weaned off the warm and humid conditions, by gradually opening vents or propping-up the lid a bit more each day, for a few days, to get the plants used to normal growing conditions. If the plants start to wilt, then close the lid and try again later. Hardwood cuttings are best taken in October and November once the new summer growth has gone woody. Taking hardwood cuttings is simply achieved by partially	burying a severed piece of stem, vertically, in free draining soil or compost	and leaving them in the ground to get on with the process of forming roots. The cutting material should be much longer than that used for soft and semi-ripe cuttings, at least 20-30 cm (8-12 in) or more. Choose straight stems and cut back to just below a pair of leaves or buds. Remove all leaves from the lower part of stem that is to be buried in the soil. Make a sloping cut at the top and a straight cut at the top so that you know which way-up the cutting should be planted. The sloping cut at the top also allows water to drain off and helps prevent the tops from rotting off. Unlike soft and semi-ripe cuttings, hardwood cuttings do not require bottom heat or a moist atmosphere. Simply dig a slit trench half the height of the cuttings and fill the bottom with sharp sand or grit. Insert the cuttings vertically, to a third to half of their length and back-fill the soil, firming them in. You can use a hormone rooting powder, but this is generally felt to be unnecessary. Water well and label the cuttings so you know what they are. A cold frame can be placed over the top to encourage faster rooting if required. Hardwood cuttings are very slow to form roots, so don't expect them to root fully until at least the next spring. If rooted well the cuttings will sprout strong shoots and grow away. Ideal shrubs for hardwood cuttings are Buddleia, weigela, privet (Ligustrum), Philadelphus, forsythia and willow, but you can experimenting with any woody shrub that takes your fancy. Taking cuttings is free, and if they don't succeed, no harm will have been done. Leaf cuttings are fascinating, because a whole new plant is formed from a single leaf or ever a small section of a leaf. African violet is a suitable subject, and the same treatment can be used for several other house plants with fleshy leaves, such as begonias, peperomias and gloxinias. Propagate by cutting a healthy newly matured leaf (with its stalk attached) from the parent plant. Place it in a seed tray or pot filled with a mixture of peat and sand. If several leaves are to be propagated together, make sure they are well spaced out and not touching each other. The leaf stalk is the only bit that is buried, leaving the leaf blade exposed. Leaf cuttings are vulnerable to both drying out and rotting before they root, so use a little bottom heat to speed up the rooting process. Cover with a propagator lid or polythene bag and mists occasionally to keep the air around the cuttings moist. Once the young plants appear, they can be potted up separately into a compost containing nutrients to meet their growing needs. Sever the leaf at the base of the plant. Insert the leaf stalk into a tray of fresh potting compost. Place in a heated propagator to encourages speedier rooting of the cutting. Leaf cuttings from begonias are done in a slightly different way. The leaf stalk is inserted into the compost and rest the leaf should be held on the surface with hairpins or small pebbles. The several slits are made with a sharp razor across the main veins; a new plant should appear at every cut. Keep the leaf warm and moist until new plants are established. Mother-in-law's tongue (Sansevieria) and Cape primrose (Streptocarpus) have long leaves which can be cut crossways into sections, 5cm (2 in) long, and each of these sections will produce new plants. Push them vertically into the compost, in the same direction as they grew. Root cuttings of perennials and shrubs are best taken in winter or early spring (November to February) when the plants are dormant. This is because most of the energy of the plant has been drawn down into the roots for storage over winter. To take root cuttings, carefully lift the plant, or dig soil away from larger plants or shrubs, then select suitable roots of good length and cut them from the parent plant. Cut large, fleshy roots into 5 cm (2 in) sections, and bury them vertically in a free draining compost, in trays or shallow pots. It is important that they are pushed into the soil the right way up. In order to identify the correct orientation of the roots, when planting, cut an angle at the bottom end of each root cutting as you prepare them, and cut the top straight across. Push the cuttings into a free draining compost. The upper face of the cuttings should just visible in the surface of the compost. Finer, more delicate roots can be separated into single strands, and placed, horizontally, on the surface of the compost. Cover the roots with no more than 1 cm (0.5 in) of compost. Cut large roots into 5 cm (2 in) sections, angling the bottom end to avoid planting the wrong way up. Bury them in a free draining compost, with the angled end down. Finer roots can be placed horizontally on the surface. Lightly water the pots or trays and put them in a cold frame or greenhouse. New shoots should appear in spring. Hardened the cuttings off in the spring and plant them out in the borders or pot them on.